In the previous four presidential campaigns, with 6 million cups (ballots) cast in each election, the 7-Election Presidential Coffee Cup Poll has correctly predicted the popular vote outcome. 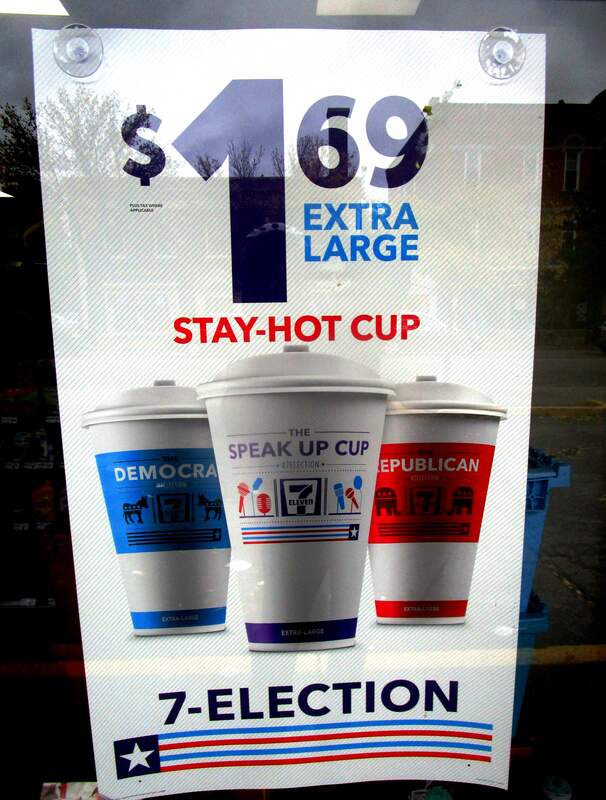 Across the country, 7-Elevens offer three coffee cup selections: Blue for Democrat, Red for Republican, and — new this year — a non-partisan Purple cup, called the “Speak Up” cup. 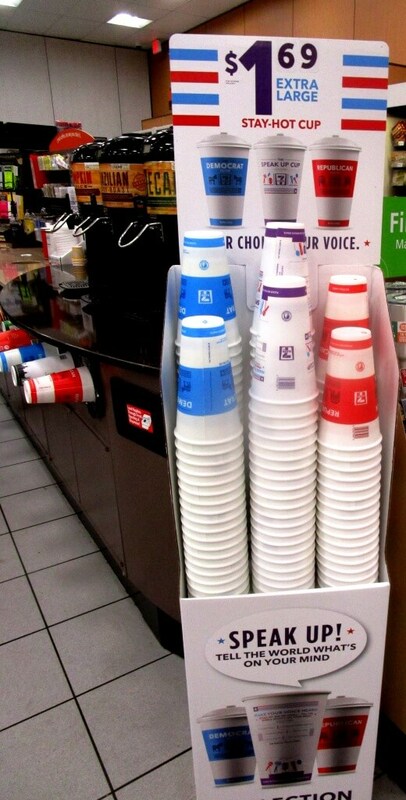 Showing its global reach, 7-Eleven also runs a Mexican version with 5 candidate cups and an undecided cup. Today, I conducted my own poll by asking clerks and managers at several Rochester 7-Elevens how the results were going. Of the 6 stores, Elmwood/Clinton, Goodman, Monroe/490 and East/Winton provided the raw numbers. Monroe/Meigs did not participate. The manager on Park found the project very interesting, but regrettably lacked time. The tally for the four stores was: 101 blue (Democrat), 97 red (Republican) and 146 purple (non-partisan or independent). Depending on the store, the tallies were for sales in the last few days. The first stop was my most frequented 7-Eleven, Elmwood/Clinton. Located in Brighton near the city line, the store provides a fairly representative population. In the morning, I see many people on their way to the UR Medical Center, as well as contractors getting coffee before doing work in Brighton. 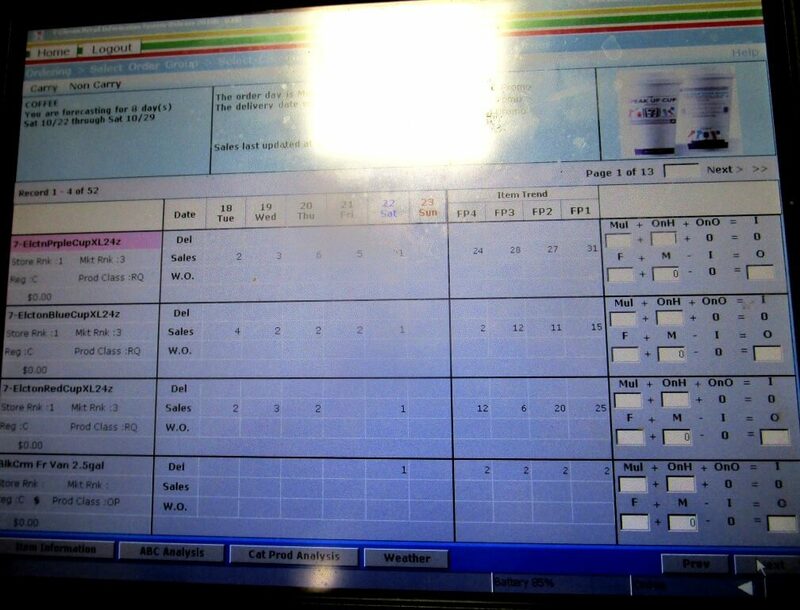 Manager Louise (wife of co-owner Rachid) was happy to show me the selections on her tracking screen: 31P, 25R and 15B. Louise says many customer are engaged with the poll. Some will say, go red or go blue when buying their coffee. Actually, the results favoring red may be lopsided due to one customer. Louise said one man comes in twice daily to buy red coffee, proudly if not loudly adding to Trump’s total. Louise also said one woman, a Trump supporter, recently purchased a red cup. But then she went back and bought a blue cup. The woman told Louise the blue cup was for her daughter, a Clinton supporter. For the sake of household peace, the woman thought it best to bring home both a red and a blue cup. Curious about the tallies herself, the clerk on Goodman readily opened her tracking screen: 28P,15B and 10R. Overall, she wasn’t sure how conscious of the program people were when choosing coffee cups. Another clerk did notice that on debate nights people took their decision more seriously. Some purchases sparked political conversation with others waiting in line. He also said that before the second debate, sales were trending red. But after that debate, blue has been on the upswing. 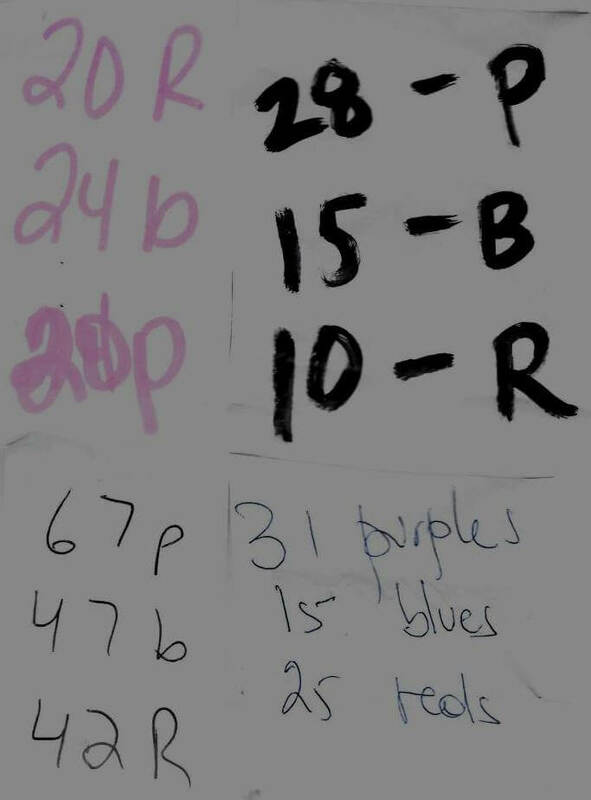 The store manger was glad to add his tallies: 67P, 47B and 42R. The manager thought customers who go directly to the display shelf are definitely choosing deliberately. At the same time, those who just grab a cup from below the coffee dispensers are probably doing so randomly. As he re-created that grasping customer, it looked like red vs. blue was a 50-50 proposition. Except for the East Main clerk, the other clerks and managers were — rightfully enough– hesitant to offer their personal opinions. When I told one clerk Trump was winning, she looked surprised and dismayed, but didn’t comment. At another store, when I mentioned the “God help us” remark, the clerk rolled her eyes sympathetically, but made no verbal comment. 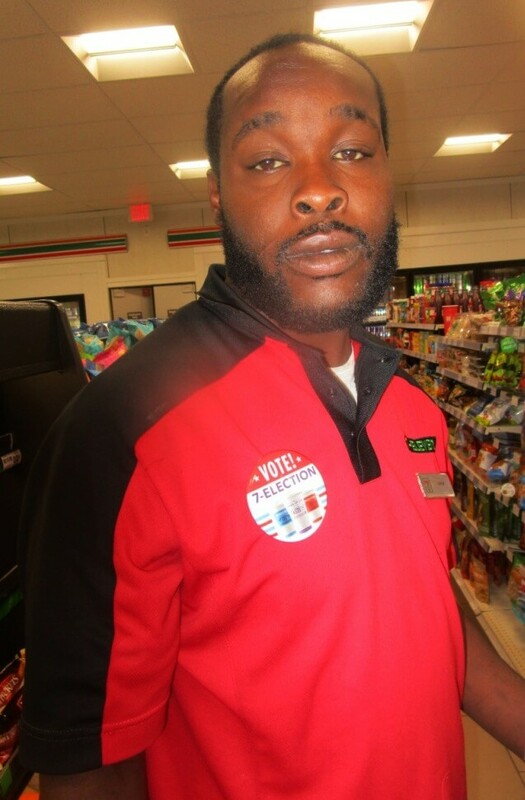 Jamar at the Monroe/490 7-Eleven. The managers and clerk at the Monroe/490 store took a lot interest in the project. The manager — who thinks overall the store is a blue (Democrat) stronghold — gave me her tallies: 24B, 20R, and 20P. In case people aren’t aware what the colors mean, one clerk always tries to explain the 7-Election to customers. She said once people know, some change their selection, while others shrug indifferently. Jamar — who also noticed more buzz about the cups on debate nights — was up for a photo op, sporting a Vote! 7-Election sticker. 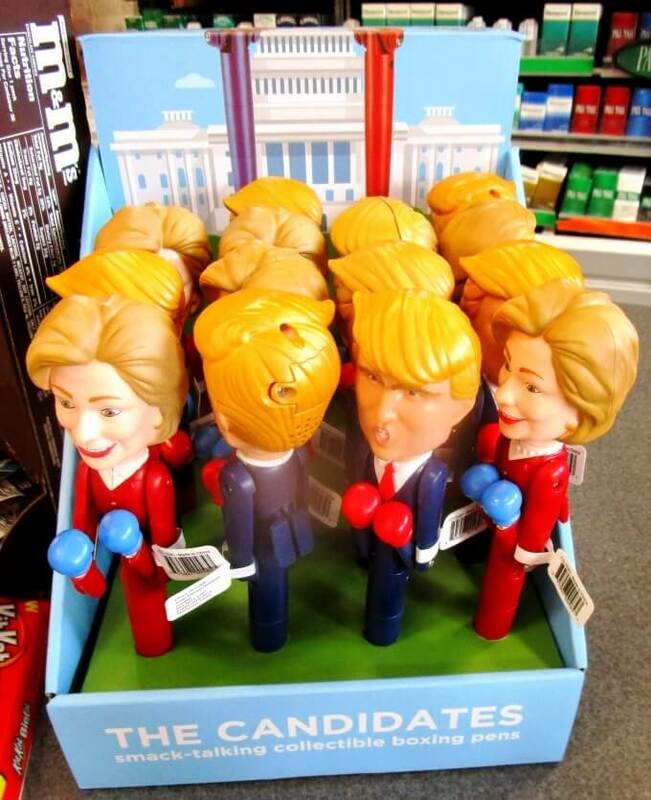 How accurate is my “coffee stirrer” poll: 101 Clinton vs. 97 Trump? Hard to say. The latest New York polls have Clinton way up, but western NY leans more Republican compared with the populous downstate boroughs. Also, as seen in P.J. Gladnick’s “7-11 Needlessly Obscures Presidential Coffee Cup Poll,” this year’s poll has some flaws. First, the addition of the non-partisan Purple “Speak Up” cup is confusing. Furthermore, this choice is by far the most popular. In my poll, non-partisan or independent cups drew the most votes by a sizable margin. As of now, purple is winning in every state except Idaho (red) and Maryland (blue). The purple choice limits the poll’s predictive accuracy. And, unlike 2012 when red cups were labeled ROMNEY and blue OBAMA, this year’s generic Democrat and Republican obscure the candidates: Clinton and Trump. People might be picking their favored party rather than which presidential candidate they like. Finally, after collecting the tallies, taking the pics and organizing and scanning the totals written on receipt tickets from each store, I learned that 7-Eleven actually reports updated results daily. You can even find the results from all the store in this study. So I didn’t even need to leave the house. But the expedition sparked some interesting conversations. And everything thought the project was pretty cool. See RIT’s John Roche offers “Orange Golem” and “Trumped.” And the Donald’s parting shots.